The AM2 audio module provide a quick and low cost addition to high-quality analog stereo input to a system. It is supplied mounted on a full-height bracket with a long ribbon cable and an audio breakout cable, for connection to any Datapath capture card supporting analog audio. This audio module does not necessarily require an electrical slot on the motherboard provided a physical slot is available in the chassis. 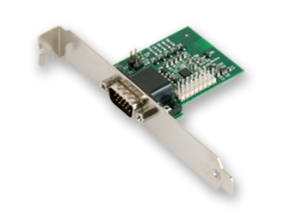 The AM2 module is compatible with the VisionAV range of video capture cards. Left and right balanced audio input on female XLR jacks. Supports microphone and line level inputs. Left and right unbalanced line inputs on female RCA connectors. Left and right unbalanced line outputs on female RCA connectors for direct pass through of selected analog input. Supports audio capture to the PCI Express bus at popular sample rates 44.1kHz/ 48kHz/ 96kHz. All are available in RGBEasy (Audio extensions) and DirectShow for development purposes. The AM2 features a common attenuator and mute function for both channels. * Denotes availability Q4 2012, contact sales for details.